The College of Design is a learning community, renowned for academic excellence, and innovative education. We offer degree programs in Eugene and in Portland. Known as a city with great arts and outdoor recreation, Eugene (pronounce it “you-GENE” and not “YOU-gene,” and you’ll fit right in) is the second largest city in Oregon. It has the relaxed amenities of a small town and the cultural advantages of a much larger city. Eugene has a mild climate with an average temperature of 54 degrees. Winter temperatures usually hover in the 30s and 40s, while summers range in the 80s to 90s. Most of the rain falls between October and May, leaving dry warm summers. 15 minutes: fish for trout in a crystal-clear river; hike through lush forests; relax in one of the 157 area parks; or catch a concert at the world-class Hult Center for the Performing Arts. 60 minutes: walk for miles on pristine public beaches; explore tide pools; watch migrating whales; mountain bike through challenging terrain or float the wild and scenic McKenzie River. 90 minutes: challenge yourself on the downhill runs and cross-country trails at Willamette Pass Ski Area; camp beneath the stars; or explore clear mountain lakes in Oregon's wilderness areas. 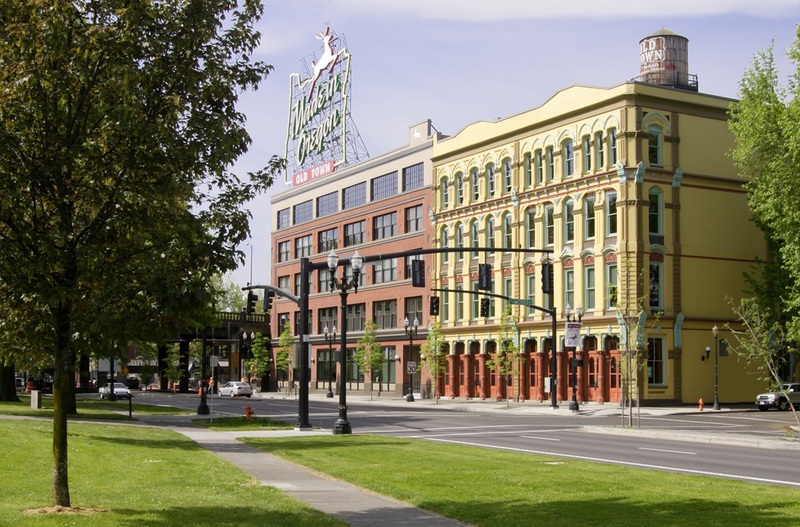 The historic White Stag Block, located in the heart of Portland's Old Town and Chinatown, houses the College of Design programs and offers state-of-the-art technology, light-filled workspaces, and a superb art and design library. Portland is the largest city between Seattle and San Francisco and is known for its exceptional city planning, progressive residents, and active art scene. Public transportation serves all areas of the city, and the MAX enables students to travel from campus to downtown for shopping, living, and connections to other transit lines. A little over an hour from both the Pacific Ocean and world-class snowboarding and skiing at Mt. Hood, opportunities for recreation abound. Portland residents are known for their enthusiasm for the outdoors, as evidenced by the types of companies that have chosen to make their corporate homes here (Columbia Sportswear, Leatherman, Nike, Adidas and more). An incubator for design-based innovators, the city has had an influx of creative people who come to experience the exceptional quality of life and work for world-class companies such as Intel and Ziba Design. Portland is recognized for its DIY culture and creative arts and design community. From film and television production to arts education, Portland artists and designers have contributed to the quality of the life of this vibrant city. The city's downtown regeneration, urban design innovations, regional growth policies, and land-use-transit planning are considered national models.